Acquired: In Person 6/15/2012, Burnet Feed BBQ Store. Probably one of the greatest free agent acquisitions in the history of the NFL at cornerback, Everson Walls has held the NFL interception title 3 times over his career, and played for the Cowboys, Giants, and Browns. He earned All-Pro Honors in 1982, 1983, and 1985, and is tied for the NFL record for most interceptions in cumulative Pro Bowl appearances. After a meritous career with the Cowboys from 1981-1989, Jimmy Johnson left him unprotected in Plan B after the team’s 1-15 disastrous season. He’d sign Plan B with the Giants in 1990- leaving the Cowboys after recording 649 tackles, 44 interceptions, and 3 fumble recoveries. 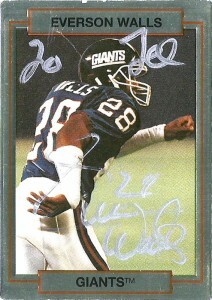 The Giants moved Walls to Free Safety to replace departed Terry Kinard, and Everson responded by notching 5 more picks en route to the team’s Super Bowl XXV victory. 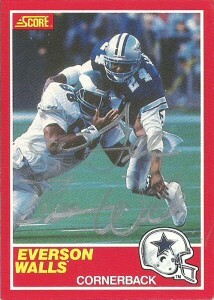 He’d also register his first pick for a touchdown against division rival Washington that year. Another season with the team and 4 interceptions in 1991, saw him split time in 1992 between the Giants and Browns with 3 picks. He’d retire after 14 seasons with the Browns in 1993. Despite having so many accolades and being named to the Cowboys 25th Anniversary Team, the NFL 1980s team, Texas Black Sports Hall of Fame, Grambling Hall of Legends, the Louisiana Sports Hall of Fame, and the Tom Landry Award, -the Cowboys’ Ring of Honor and the NFL Hall of Fame elude him to this day. I think it is an absolute crime that Walls is not at least in the Ring of Honor as he was one of the most complete defensive backs during his tenure in Dallas. Some say it was because of the 49ers Dwight Clark made that grab over him in the Championship Game, while others say it is because of his acrimonious hold outs, but I tend to believe that the NFL overlooks the corner position, if you are not as flashy or noisy as people like Deion Sanders. Walls wrote a book in 2009, (“A Gift for Ron”,) chronicling his life and detailing his decision to donate his kidney to save his best friend and teammate on the Cowboys’, Ron Springs life. To me that’s worth it alone to demonstrate Everson’s humanity and compassion, emphasizing a trait that all members of the Hall of Fame should strive for. He spends a lot of time on the road donating his time to charity, and works on TV and radio where he is immensely respected for his knowledge and understanding of the sport. 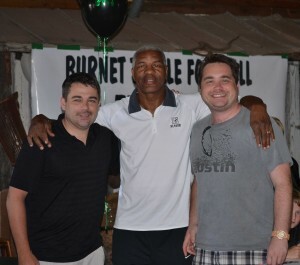 I had just joined the Texas Autograph Club, when I looked at the upcoming events and spotted a post about Everson appearing at a BBQ joint in Burnet, Tx -which is right down the road from me. I unpacked some cards and grabbed my friend Josh and went to meet him. While the signing fee was stiff, it was totally worth it, as the money was going to help out the Burnet kids football team. Everson told me that first he’d like to be put into the Cowboys’ Ring of Honor, and then poked fun at the Giants card in front of the kids who were there that we were helping out.